Being critical of science does not necessarily mean declaring “war” or “ignoring” “facts.” I heard a great quote by Carl Sagan on remaining vigilantly skeptic of science that I haven’t been able to locate. Skepticism and critical thinking are healthy and important tools of science. Science is not hard and true fact. It is constantly evolving (no pun intended) with new studies, new discoveries, new hypotheses, etc. That’s the entire point and function of it. Science has said a lot of things that we now know to be untrue, or at least not entirely true. And especially these days, with money and power behind so much contemporary science, *not* questioning science is a sign, to me, of a fanatical and uncalled-for faith. You know, like religion. Science is an awesome tool. But it is just that: a tool. It is not, in and of itself, absolute, capital-T Truth. It grows. It changes. It’s great when it accompanies actual, subjective, individual thinking. 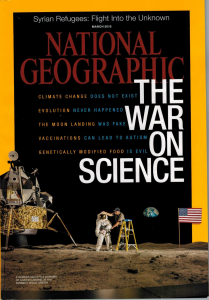 It could be said that the claim of this “war on science” is really just a war on critical thinking. Also, “Remember that science is not the pursuit of truth, it is the systematic acquisition of data for the purpose of understanding how nature operates” (Katy Bowman).